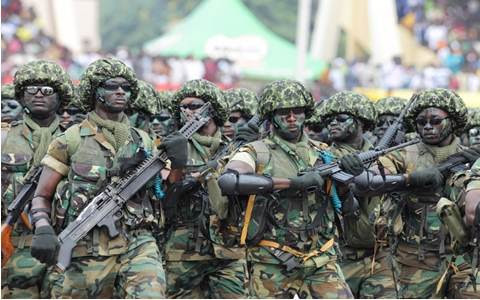 he Army hierarchy is deliberately slowing down the war against Boko Haram so that its corrupt generals can continue siphoning funds, a soldier involved in the counter-insurgency operation has alleged. According to the soldier, who simply identified himself as Kumashe Warrior, the Army has turned the operation into “a business for their selfish interest”. He said the welfare of soldiers is so horrible that they are denied basic warfare items such as desert uniform, boots, fragmental jackets and helmets, while soldiers fighting for the country eat like Almajiris. “The game is: the more they delay the fight, the more the money they make; through allocation received from the Government,” he wrote. He urged the Federal Government to launch a thorough investigation into the operation in Borno to “detect the corruption and atrocities involved and bring to book all the perpetrators”. As I write, I am Deployed in Operation Lafiya Dole under 7 Div, 21 Bde to combat BH terrorists in Borno State. This operation is being handled majorly by the Nigerian Army, barely Air Force and Navy. The corruption here is deadly, lethal and gruesome. The DHQ has received a huge amount of money (almost 10 billion naira) from the federal government to execute the task of wiping the terrorist without delay. Sadly, the Army generals have turned it into a business for their selfish interest. The game is: the more they delay the fight, the more the money they make; through allocation received from the Government. In order to achieve the delay, they have refused to supply us with the necessary equipment required to face the terrorists. They have not brought the fighter jets for aerial bombardment. They have also refused to bring supporting weapons that would aid the fight, the likes of GPMG, RPG, AA etc. We are being endangered, because the camps of the terrorists are not far from our location. We didn't have vehicles in our camps, so we cannot move in to attack them; because it would be suicidal. These terrorists have enough equipment; so, we cannot match them. Since March till now many soldiers have been killed by the BHTs because they have seen we don't have the right tools. This is unfair! The federal government has been trying to end killings, by spending much on security. The DHQ has the largest fund allocation for security purposes, especially during this period of security challenges, but the monies are being embezzled. On our welfare, there are items that are supposed to be given to us like Desert uniform, Boots, fragmental jackets, helmets etc, but they refused to give us when we are on the field, inside the bush fighting for our nation, Nigeria. We are the ones who need it, not them. They will end up selling these materials, once they succeed in not giving them to us. Our feeding is not what we can write home about, soldiers that are fighting for the country eat like “Almajiris” the Commanding Officers embezzle soldiers feeding allowances and use it to build mansions in the city , (Reference to Battalion Commanders under 21Bde Bama LGA Borno). It is part of welfare granted to soldiers that are in the operation ground to be issued pass once in every three months, but the current Commanding Officers under 21 Bde Bama especially 152Bn CO Lt Col I Ogundele denied soldiers of this benefits and it has drastically reduced their fighting morael . Our allowance is another issue; we learnt each person is entitle to ninety thousand naira (90,000) per month, but we are being paid 30,000 naira. This money is readily available, but the Army generals in charge are just too wicked and heartless. People have been grumbling, but to no avail. No one dares talk. I keep wondering if it's a crime to fight for the nation, because of what we are going through in the course of service. The federal government allocated billions of naira for this assignment, if not more. Why are we being maltreated for no just reason? Virtually everyone is broke; yet the so-called token 30 thousand is not paid as supposed . The federal government should launch a thorough investigation into the ongoing operation in Borno State, to detect the corruption and atrocities involved and bring to book all the perpetrators. We beseeched the Federal Govt, CDS, COAS, GOC 7 DIV, and the Comd 21Bde to carry out thorough check and balance in all the concerned authorities in order to motivate soldier's morael towards their duties. spread this message till it gets to the Presidency. God bless Nigeria.